Language is a living thing. It evolves faster than we evolve, guided by new social and technological developments. New words are coming to life and old words are changing their meanings. Language is becoming more efficient, and so should the people who work with it. Striving to be better is an important part of working with words. The idea that inspiration and talent are what makes a writer great is a romantic and false one. It takes some work to be good, and even more of it to be great, especially for a person writing in a professional capacity. If the prospect of having to constantly better yourself frightens you, don’t worry. It doesn’t take that much work to see major improvements. You can do a lot with just four steps. Most writers come into contact with a style guide early on in their careers. Journalists, for example, might work at newspapers that have house style guides, like the Guardian or the New York Times. College students are probably familiar with Turabian and the MLA Handbook. The Associated Press Stylebook is one of the most commonly used general style guides. There are two key benefits of using a style guide. One is the consistency. For example, you might be inclined to write numbers as figures in one part of the text and spell them out in another part of the text. By following a style guide, you will add uniformity to your writing and allow the reader to concentrate on what is written instead of how it’s written. The other key benefit of using a style guide is that it allows you to write for a specific audience or type of publication. Journalists and academics have style books that allow them to write and format their work according to the standards of their publications. For business writing, the most popular style guide is probably The Gregg Reference Manual. For legal writing, The Bluebook is a necessary citation guide. For those interested in online publishing, The Web Style Guide is an invaluable tool. There are two meanings to this tip. First, you should stay on topic and not stray away from it, which is pretty self-explanatory. Second, you should avoid overly long and complex sentences, as well as filler and fluff words. This one needs an explanation. Let’s say you write a very long sentence that explains a complex thought or a series of events. While editing, you notice you could easily divide it into two shorter sentences. The recommended course of action would be to do it. Shorter sentences are easier and less tiring to read, and you don’t want to tire your readers. The same goes for filler words—very, really, truly, just, and often that. If you can remove them without losing the meaning of a sentence, do it. Proofread Like Your Life Depends on It This is probably the best way to make your writing more professional. There’s no shame in admitting to making mistakes, but there is shame in leaving it at that. 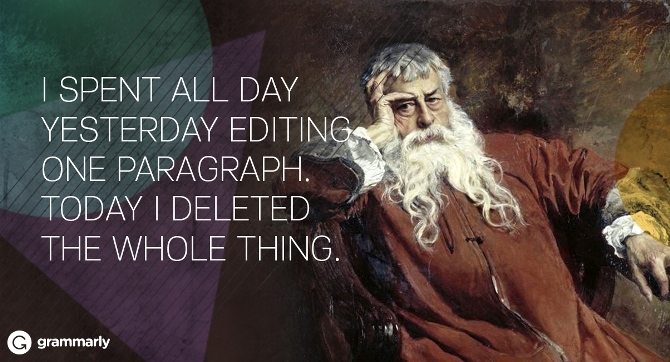 Use proofreading software like Grammarly’s to help you weed out spelling and style mistakes. Read articles about proofreading. Turn to Purdue Online Writing Lab for advice. Whatever you do, make sure you never turn in a piece of writing that hasn’t been proofread thoroughly.